You must make reservations at least 5 minutes in advance of the time at Rodos. 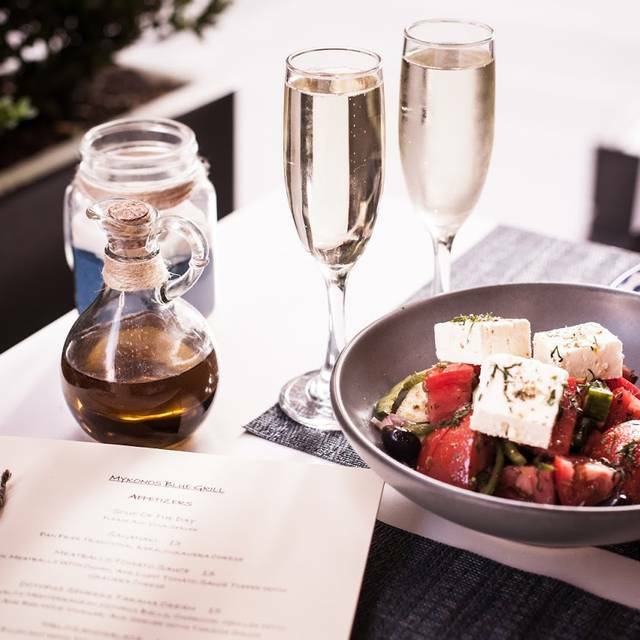 Rodos features a variety of modern Greek favorites blended with bold global flavors on a menu curated by famed Chef Emeril Lagasse. Restaurant was out of much of the menu and all of the fish. Service was poor. Both were great last time we ate there. Pulsed deal was great value-so much food although regular menu prices are on high side. Appetizers of grilled octopus & haloumi, greek salad, warm pita bread & 3 dips, mains of lamb chops & branzino & dessert of cake & choc mousse. Everything was delicious. The branzino was even boned. The decor is somewhat non descript. Even with only one server, service was good. I didn’t even try the food here. The menu items changed from Emrils Cajun Greek fusion to nondescript entrees. I sat at the table for 15 minutes without anyone taking my drink order or explaining any menu items. I walked out without anyone noticing or caring. Do yourself a favor and walk down the street to the Italian Restaurant. Much better! I thought the food was delicious and authentic (despite previous reviews!) - the service was a little slow, but nice and friendly. Coming from Greece, I felt the food was higher quality and a great deal with the Pulsd voucher. Definitely coming back! The food was good, but it was all Greek...when it was advertised as Greek/Creole fusion. We never saw anything remotely Creole. Also, this mysteriously no longer has any connection with Emeril Lagasse... which was the reason we wanted to go. I guess after their two month affiliation, Emeril had enough... I don’t think we will be going back. The great sounding menu Emeril prepared is completely gone. This place is a disaster. We were informed they didn't have any more of the dish...45 minutes after we ordered. It was almost empty and the vibe was a bit creepy. We ended up leaving. Our apology dessert came within seconds. Clearly they have a lot of practice there! The bar is lovely though and if you're staying at the hotel it would be nice to get a drink and maybe even an appetizer there. I predict this place won’t be open long. We actually left within 10 minutes of being seated. The online menu sounds so good and interesting. The menu they gave us said “salmon,” “ chicken,” “pork chop”- ie no descriptions and nothing interesting about the dishes. The service boded poorly setting our table after we sat literally one plate at a time. In order to make it in NYC, they’re going to have to make some improvements and quickly. Service was terrible. Food mediocre with many items unavailable. Offered dips and pita that we did not order and charged us. The food was amazing. A real find! They changed the menu a week before we came and had a “transition menu” that was very basic, had no explanations, and lacked the exciting dishes I was excited to try. We also had to “remind” the waiter several times that we hadn’t received our drinks or pita. Took a long time to get the check and waiter started lurking around while we were waiting for our Uber at the end of the night - very creepy. Staff clearly needs more training on the menu and basic etiquette. The menu is different than the one on line. Now a classic Greek menu, as Emeril has apparently severed ties with Rodos. Not the meal we expected. And not the menu on the website. Food was good, but disappointed that things changed without any notice. Looks like Emeril Lagasse dropped out. I got food poisioning I would not go back. The staff was not attentive either. Plan a trip to NYC from Georgia and found Rodos. After reading their menu book our reservation. Go tonight for our reservation, we sit down start going down the menu. Waiter comes over to take order. Then waiter tell us 5 of the things we were wanting they didn’t have because they had a busy weekend. I’m sure it could have been but today is Tuesday you would think they would have restock their food Monday. Very disappointing. We got up to walk out Waiter told us to come back on Wednesday they will be restocked then. An absolute mess from start to finish. Hostess was rude when we came in. Waited 25 minutes past our reservation time for our table. After we sat it took 10 minutes to get water and menus. The restaurant was out of 5 dishes, including 3 we tried to order, including barbecued shrimp, gumbo and crawfish pasta. They forgot to bring the drink my wife ordered and needed to be reminded. Food came out in a strange order with my appetizer coming out after we had finished our entrees. They kept delivering our food to the table next to us and vice versa. Even brought our bill to them! Waited forever for the check and for them to pick up the credit card. The person who appeared to be the manager apologized and did give us a free glass of wine, but unfortunately, nothing could make up for the night. Last night I had the delight to host a birthday dinner at @RodosNYC. It was my third visit to this new restaurant. I am familiar with earlier restaurants in this location and @RodosNYC is refreshing. Warm, inviting and professional. Mr. Chatiris was on the premises and made everyone feel like family. Ike, the GM who I know from other hotspots around town, was also on hand. I have spent time on the Island of Rodos (Rhodes) and have enjoyed countless meals surrounded by family and friends. @RodosNYC brings the same sense of joy and the food is inventive, beautiful and delicious. Emeril has captured and married the flavors of the Greek islands and New Orleans to perfection. The Greek salad reminded of dinner in Chania and the duck was out of this world. When you walk in the door, tell Ike I say "hi"and try to get a seat at the family table in the front or a private table in the wine library in the back. Fantastic in every way! Only suggestions was that it was a little too loud. Otherwise, perfect! The food was Delicious. Highly recommend the Long Island Duck and Portuguese tarts for dessert. Food was great. The staff was attentive and professional. We were very pleased with our experience. The chocolate mousse was heavenly! My mom and I are huge fans of Emeril so when we heard he finally opened a restaurant in New York City, albeit not his traditional Cajun food, we still had to go. We came early on a Sunday evening of a weekend holiday so it was quiet. It's a very pretty spot with a nice atmosphere. We started with wine and Prosecco, pricey but a nice pour on both. For the app we shared the baked clams; 5 in the dish, overly stuffed and topped with cooked greens, slightly spicy and outrageously delicious! The warm pita on the side was the perfect vessel for sopping up the broth. For entrees we decided on the Linguine Nero and the Gumbo, both under the "Little More" portion of the menu which are larger than apps but smaller than the mains. My dish was a great portion and also very delicious, the pasta was cooked perfectly al dente and lobster was tender. Mom had the gumbo which was smaller than anticipated but also very good and not spicy at all. For dessert we ordered the baklava, a small cast iron skillet take on the original but topped with shredded phyllo instead of layers. Unlike the traditional super sweet version drenched in honey, this was just slightly sweet, very nice. We were also given 2 complimentary Raspberry Custard Tarts. They were warm, fluffy with a slight tartness from the raspberries, a perfect end to a great meal. Swordfish special was the best I've ever had, otherwise restaurant in all categories was just fair. We were seated in back corner because we were a table of 5 with absolutely no ambiance. Greek salad was all tomatoes. drinks were nothing special and expensive at $19 each. I ordered bourbon and they had neither Makers Mark or Buffalo Trace. Many much better Greek inspired restaurants in Manhattan and the only way they might make it is because of Emeril's name associated with it. THe cuisine was top notch, super delicious, can’t wait to go back again. Food was spectacular. Service too. Thank you! We had three appetizers that were amazing. They were all so flavorful but just right; not too much. We also shared a Greek salad and the tomatoes in it especially were fantastic. We then split the fish filet for two which was superb. The service was great as well. Fantastic evening. 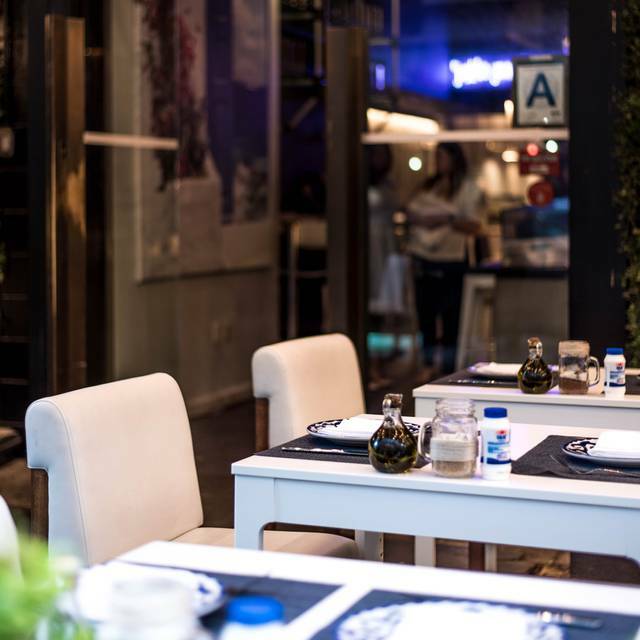 If you are expecting the typical amazing Greek food…it’s a No, the food is nouveau cuisine for sure. The place is beautiful and in my opinion very elegant. The service was very good overall. The food I must say didn’t cut it for me, it’s overpriced and just OK. The baklava was simply awful. They really need to bring the “Greek” back and try to create more traditional dishes with less sauce and more flavor. Overall I was disappointed and not going back. The food was excellent; we had the gumbo, barbecued shrimp, wilted spinach salad, brussel sprouts and gigante beans. I thought the gumbo and shrimp were standouts; my wife agreed on the gumbo, but preferred the salad and brussel sprouts. We agreed that the gigante beans were good, but typical. Here's my reason for the four stars: the service was very accommodating and pleasant, but we were there for Valentine's Day, so the place was hectic for the obvious reason. Still, the staff was essentially power-walking throughout the restaurant, and their rushing seemed manic, so it was pretty distracting. I witnessed one waiter hard-bump another out of the way, and a bunch of near misses. I appreciate the restaurant striving for efficient service, but taking a couple of more seconds from the kitchen to the tables would provide a much calmer dining experience,. Service was great. We had the Greek salad and fish for starters. The Greek salad was great. For mains we had the branzino and lamb chops. The branzino was a bit dry and didn’t have great flavour, we had to ask for a bunch of lemons to add some flavour. The lamb chops were over cooked and didn’t have any sort of flavour, for $42 you only get two small lamb chops. We ate a side of lemon potatoes which were good. The waiters brought complimentary desert over and the chocolate mouse was delicious! Overall I wouldn’t go back but if I did I would only get the Greek salad and chocolate mouse. While open table allowed booking for 1pm we found out at arrival that the restaurant opens at 6pm. I had a guest visiting from Europe with tight schedule, so it was a very disappointing unpleasant experience and also extra cost of taking a cab there for nothing. Our waiter was awesome but the fact that we were sitting by the entrance the entire wait staff was standing there watching us eat ( we had a 10:30 pm reservation so it was empty ) it was a bit awkward for my fiancé and I other wise our waiter was very well trained and very knowledgeable about the menu everything was a punch of flavor but the crispy duck wings was a bit of a let down delicious yet mediocre. Our first time at Rodos and we will be back , Service was wonderful , our waiter was very knowledgable and very personable . Food was very good , my only complaint was that the duck was a little over done but still very tasty. I like Greek food and I like Cajun food, however some of the parings don’t work well together. However there are enough positives that make it worth a 4 rating. 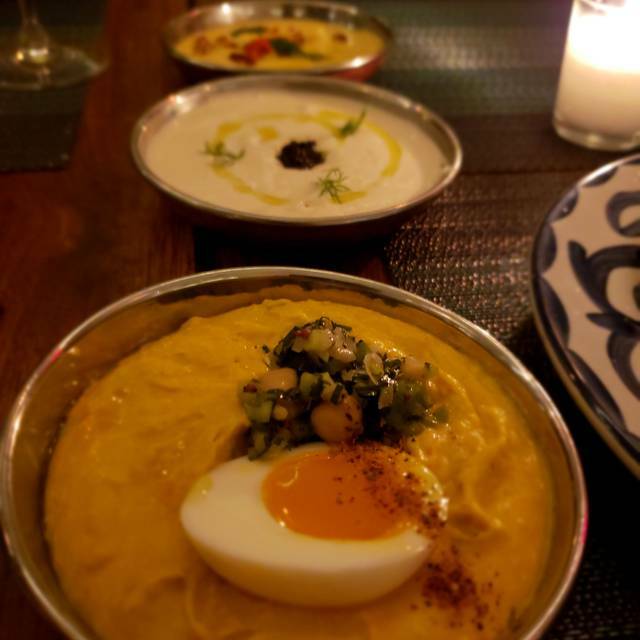 Hummus and duck are fantastic. However special tuna risotto with harissa sauce is a miss. First off, the entrance to the restaurant is from the hotel lobby next door which was a little strange. The front doors actually just had an awkward velvet rope in front of them from the inside. The head of house were both dressed a little messy, the suit was wrinkled and the shirt was ill fitting, which is a little off putting to begin with. The waitstaff took 10 minutes to show us a menu and another 10 to take our orders. Another 10 minutes went by and we had to ask another waitstaff to get us our drinks. The food came out rather late too and was not at all special. The duck wings were crispy but had no distinct flavor to them. Basically tasted like a fried wing from a local Chinese spot in my neighborhood, nothing special at all. The stuffed shells was actually a plate of small shells in a cream sauce with small lumps of crawfish. Some of the bits still had shell on them and was not removed. And for the entree, we had ordered the special which was a whole white fish. The fish itself was tasty, but as advertised it was going to be on a bed of fennel. When it got to the table, the fish was garnished with fennel frawns.........confused and disappointed pretty much sums up this place. I do not recommend this restaurant to anyone because it is simply over priced, simple food, and not special at all for the price or experience. I’ve had better food and service at many diners off the freeway on road trips. Hopefully, considering this is Emeril’s first NYC restaurant, he can see and compare to the other great places in the city and see everything that his restaurant is not and how the competition blows his business out of the water. The restaurant has only been open a few weeks, so I understand that they are still tweaking things. I was disappointed with the food. The portions were small and overpriced except for the Lavraki which was delicious and well-sized. The servers were friendly, but unpolished. I canceled my upcoming reservations.